The Argus International Gig Regatta 2018 saw 17 pilot gig crews rowing against each other at three events held around the island over the past week. 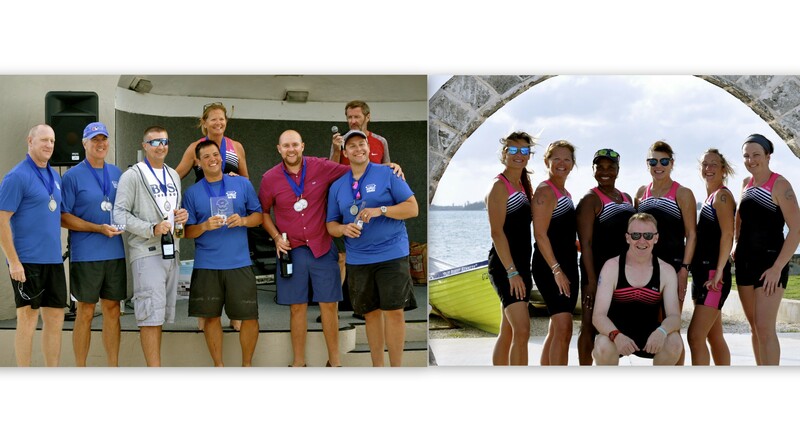 This is the Bermuda Pilot Gig Club's second International Rowing Regatta and organizers thanked all of the sponsors, community supporters, BPGC members, and volunteers who made it all possible. Day Two of racing was moved to North Shore off of Admiralty House Park due to strong SE winds but that did not deter the crews or spectators who had a great view as each gig jockeyed for position around the course with three buoy turns and a final leg straight into 20 knot winds. These traditional pilot gigs can handle rough seas but they require a coordinated and strong crew to get them moving quickly in such conditions. The Ladies' crews took to the waters in the first two heats of the day which led to six teams qualifying for a very exciting final. The SPBC Salty Sirens were second around the first turn in the final, but overtook the ladies from Cotehele Quay shortly after and led the rest of the way around the course. The Men's crews closed out the day of racing with a timed start based on the results of their first race of the day. Team Jurassic held off the SPBC Wonder Stroke crew for the final race but the Wonder Strokes took home the winning trophy for the Men's Division.